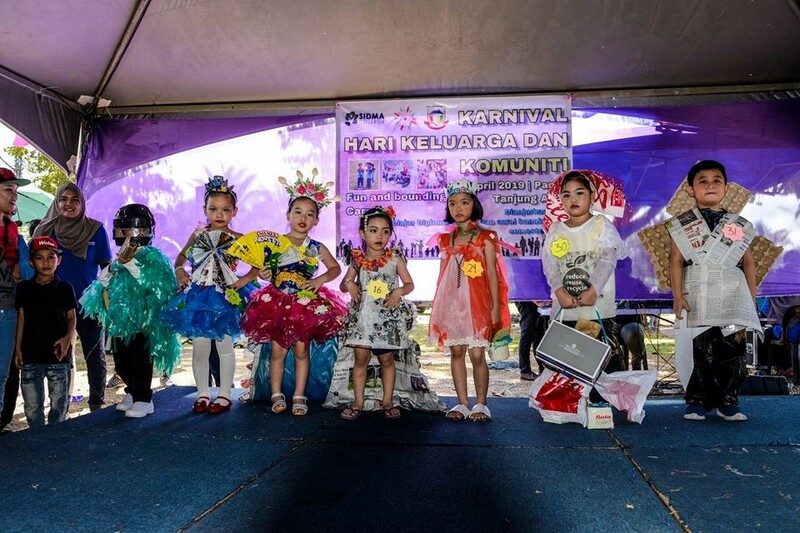 SIDMA College Sabah Semester 5 and 6 Diploma Early Childhood Education (DECE) students have successfully organised a Family and Community Carnival at Tanjung Aru Beach, Kota Kinabalu on 13 April 2019. The 298 DECE students, with lecturers: Miss Nur Syafiqah Binti Usno, Miss Ivy Evannie Cyril Gusipin, Miss Valeria Padris, Madam Jessica Tangau and Madam Suzie Jainil as facilitators; collaborated with the management of SIDMA College Sabah to implement the carnival. The event was officiated by Mr Terence Boyd Stephen; Manager (Student Affairs Department). In his official address, he stressed that the key focus of the programme was to expose SIDMA DECE students to better understand the related information, resources and tools to empower families, communities and schools together in partnership with one another, and collaboratively advocate for the growth of early childhood education students. Kids in the modern era have so various needs; and teachers just can’t manage them in isolation. They need their family and even the whole community to be working with them; such as during weekend trips, family day and more. Children grow emotionally, intellectually, and physically through their relationships and their community. They might find this community in school or at home, on the playground or in the backyard. He hoped that students will benefit and gain knowledge and skills from organising the event. Through networking with the respective community, it will enhance the cooperation and collaboration among schools, families, community groups, agencies in community. Schools can work with government and other agencies, voluntary organisations, as well as individuals and together develop a productive community connection. Through action such as repainting schools, landscaping of school compound, cleaning of school compound, building temporary classrooms and more it will create a warm, inviting and conducive atmosphere for the school children to learn. For the event, SIDMA College students managed to form partnership with Kota Kinabalu Fire and Rescue Station and invited them to demonstrate on the use of fire-extinguishers to extinguish or control fire in case of fire outbreak in school or at home. Queen Elizabeth Hospital Kota Kinabalu, through its Children Dental Department nurses demonstrated to kids and their parents on how to take care of their teeth. The traffic police department also participated by sending a team of traffic police officers to demonstrate on road safety procedures reminded parents that they should always remind their kids prior to sending them off to schools. Through such networking with kindergartens in and around Kota Kinabalu and Penampang districts, more than 100 parents brought their kindergarten children along and benefitted from such programme. Some of the collaborating partners also sponsored goods, such as food and drinks for the kids, hampers as well as prizes for winners of competition held. Among the fun-based activities held for kids in the morning are kid’s fancy dress parade, filling bottles with water, and more. The event ended with tug-of war between the students and lecturers. Adjunct Prof Dr Morni Hj Kambrie (Chairman and Founder) and Madam Azizah Khalid Merican (CEO) who were impressed with the effort and energy exhibited by the team of SIDMA DECE students for conducting the activity without official financial support from SIDMA Board of Management. They managed to solicit funding through partnership with the related community. Dr Morni also took the opportunity to thank Dewan Bandaraya Kota Kinabalu (DBKK) for using the carnival site and its basic facilities such as toilets, and more. He also thanked the volunteers and officers from the various agencies such as Queen Elizabeth Hospital, Police Di Raja Malaysia, as well as from various other departments and agencies for their support, contributions in materials and in kinds. He also thanked all SIDMA College staff, parents, and the general public who took time off to bring along their kids to the event. This entry was posted on Wednesday, April 17th, 2019 at 2:32 pm	and is filed under SIDMA College City Campus, Kota Kinabalu.. You can follow any responses to this entry through the RSS 2.0 feed. Both comments and pings are currently closed.